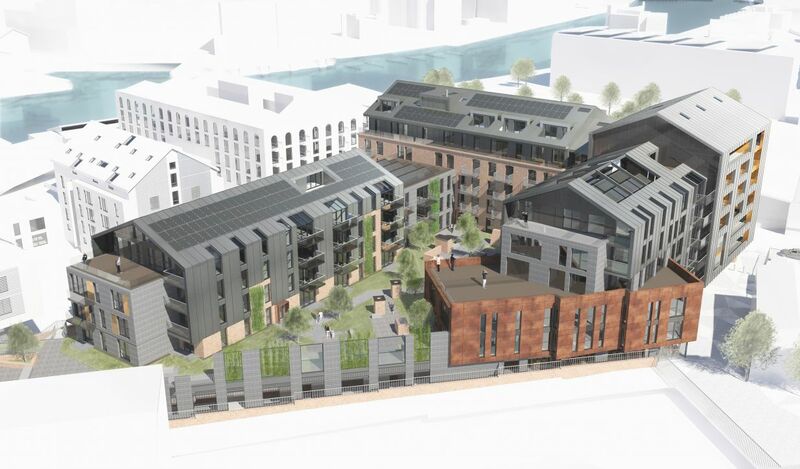 A formal planning application for the redevelopment of McArthur’s Yard on the historic Bristol harbourside has now been submitted to Bristol City Council, following a series of consultations. Plans for the site, which has been vacant for over 20 years, include the development of 147 residential homes, mixed commercial workspace, and a café. The proposals have been created by The Guinness Partnership, one of the largest providers of homes for affordable rent and sale throughout England. Built environment consultancy Nash Partnership was appointed to provide the planning, urban design and architectural work, alongside other specialist consultants. Extensive discussions with key stakeholders and the local community have helped to shape and evolve detailed planning and design work, to ensure that the tone of the development compliments and enhances the local environment. Built in the early 19th century as a malt house, the site comprises a series of warehouse buildings and structures which became the headquarters of Bristol-based metal merchant McArthur’s Group. The site has remained empty for 20 years and is one of the last remaining development sites surrounding Bristol’s Floating Harbour. It is anticipated that a decision on the proposals will be made during Autumn 2017 with development work starting early in 2018.